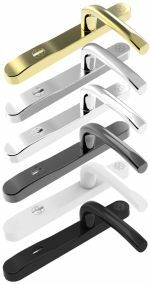 Range of door handles for double glazed uPVC, composite and timber doors fitted with multi-point locks. 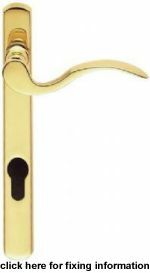 Pro Secure door handles for upvc, composite or wood doors fitted with multi point locks. 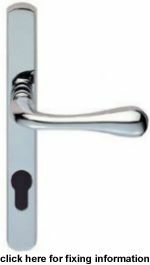 The Pro Secure handle range combines visible security features with concealed reinforcement technology, providing dual protection against cylinder snapping and handle snapping. Sizes available: 220mm or 240mm backplate. 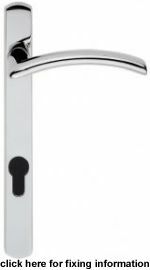 Narrow plate uPVC door handles, size 210mm x 26mm. Available in 92mm & 70mm Euro Profile centres. 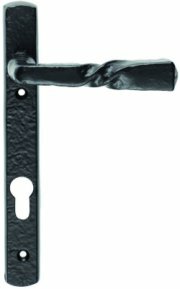 Universal fitting for left or right handed doors (supplied in pairs with fixings and follower bar). Narrow plate uPVC door handles, size 210mm x 25mm. Available in 92mm & 70mm Euro Profile centres. Available in Polished Brass, Polished Chrome & Black. The fixing screws need to be fitted on the inside of the door, on a right handed set the fixings are on the handle with the lever that points to the left, and on a left handed set on the handle with the lever that points to the right (supplied in pairs with fixings and follower bar). Narrow plate uPVC door handles, size 220mm x 26mm. Available in 92mm Euro Profile centres. Avaiable in PVD Stainless Brass, Polished Chrome & Satin Chrome. Avaiable in Polished Chrome & Satin Chrome. The fixing screws need to be fitted on the inside of the door, on a right handed set the fixings are on the handle with the lever that points to the right, and on a left handed set on the handle with the lever that points to the left (supplied in pairs with fixings and follower bar). 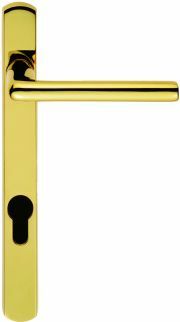 Solid brass narrow plate uPVC door handles, size 218mm x 26mm. Available in 92mm & 70mm Euro Profile centres. Universal fitting for left or right handed doors (supplied in pairs with fixings and follower bar. 316 Grade stainless Steel narrow plate multi point lock door handles, size 220mm x 32mm. Available in 92mm Euro Profile centres. 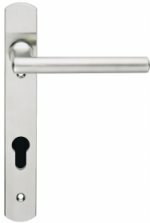 Foxcote Foundries black iron narrow plate door handles for use with multi point locks, backplate size 218mm x 30mm, lever length 120mm, projection 60mm. Available in 92mm Euro Profile centres. Narrow plate PVD brass door handles for upvc, composite or wood doors fitted with multi point locks. Size 220mm x 26mm. Available in 92mm Euro Profile centres, 122mm fixing bolt centres.